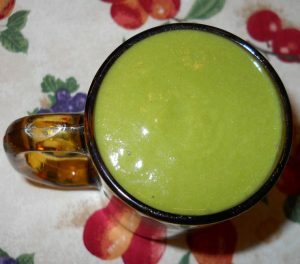 Apple banana peach collard greens smoothie is a delicious vegan recipe with which to begin the day. We each have two or more 12-oz. glasses of a vegan smoothie for our breakfast (or any other time of the day), so we usually completely fill the large container of our Vita-Mix high speed blender. Preparation time is about 15 minutes. If you wish to make a smaller amount, cut the recipe in half. Wash the apples and peaches and cut into sections so you can remove the cores and pits, and place the cut pieces in the bottom of the blender container. Wash and clean the fresh collard greens, and add to the blender container until it is 3/4 full with the fresh, frozen or cooked greens, peel 2 of the bananas, and add the bananas to the blender container, forming a bowl in the center of the container for the flax seeds and stevia so that the seeds don’t touch the sides of the container. Add the ice, cover, and run the blender at high speed until the ingredients are smooth, using the tamper as required. While the blender is still running at high speed, add any remaining greens, extra apples, bananas, peaches and/or ice through the hole in the cover to fill the container and achieve the desired consistency of the smoothie. Pour into glasses and serve with a straw. Enjoy!